and silly toys, egg hunts, pictures with "The Easter Bunny", picking out frilly dresses and shiny shoes, crazily decorated Easter bonnets, and of course dying eggs! Soooo much fun!! And this all happens just as the weather invites us all outdoors! What's not to Love?! 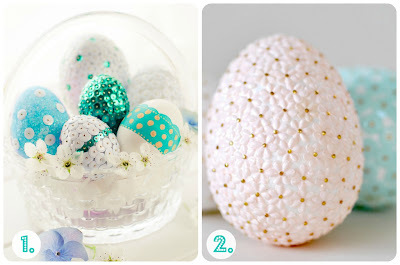 Beaded and sequin eggs are one of my all time favorite collectibles! I've been lucky enough on a few occasions to find them in the original pkgs...as kits! They were super popular at 5 & Dime stores in the late 50s early 60s. I went through a biiiig beaded everything phase a few years ago! And boy did my thumb pay for it! Fruit, stars, hearts, eggs, you name it! 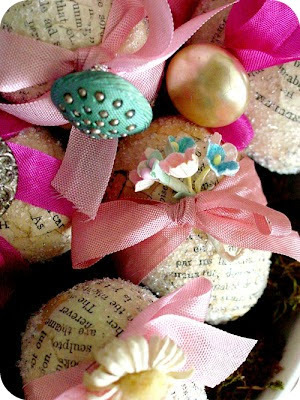 These darling decoupaged prize eggs stole my heart a few years ago. Made by my super sweet and talented friend Amy Powers...yes, the gal I mentioned a few posts back. They are just perfect! Super easy and totally instant heirlooms. 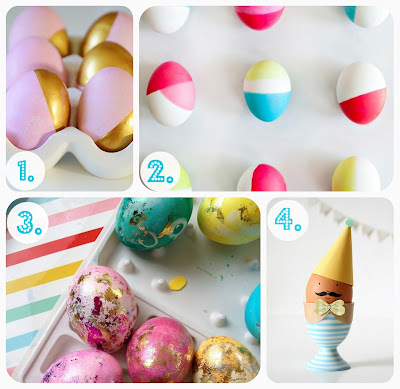 Have you... or will you be dying eggs this year? Anything fun planned? I'd love to see! Wow, these are amazing. Thanks so much for sharing these with us. I haven't decorated an egg in years as all my kids are grown up. Maybe I should rethink this and do them just for me. The eggs are beautiful but I just can't see me figuring out how to do all that. And not sure anyone would appreciate them enough for me. They are GORGEOUS and I'm jealous of the person who can be that egg creative. Love the gold dipped ones for some reason. Wonder what you would use for that? Jenny! I love, love, love your blog! And I cannot say thank you enough for stopping by my humble little piece of the internet. You are really sweet. I love your tutorial round up too! You chose such pretty and inspiring images. I'm a sucker for metallic as well and those prize eggs are just darling. Every Friday I do tutorial round ups, so stop by some time for a little fun.